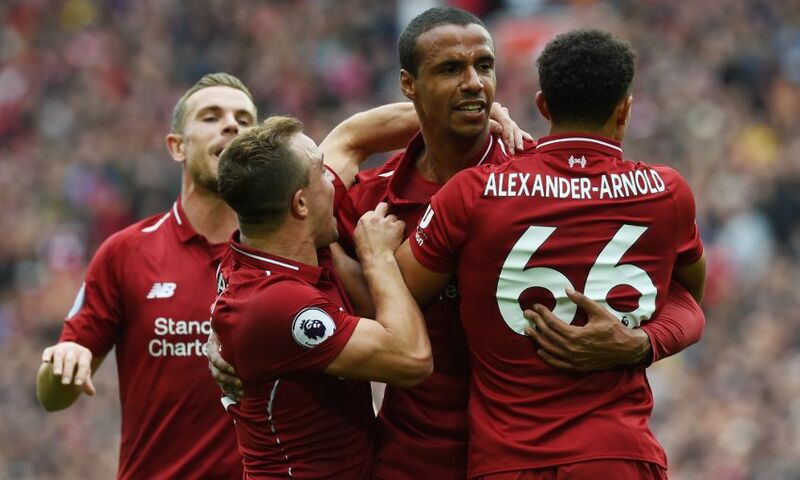 Liverpool set a new club record of seven straight victories at the start of a season as they cruised to a 3-0 win over Southampton at Anfield on Saturday. The Reds went in front with 10 minutes elapsed when Xherdan Shaqiri’s strike deflected off Shane Long and against the shins of Wesley Hoedt and over his own goalline. Joel Matip then marked his maiden start of the season by netting his first goal since last November when he diverted a corner into the back of the net with his head. Salah added the game’s third goal, slotting in from close range after Shaqiri’s stunning 25-yard free-kick had crashed back off the underside of the crossbar. It meant Liverpool returned to the summit of the fledgling Premier League table, with Chelsea not in action until Sunday at West Ham United, as their outstanding start to 2018-19 continued. Jürgen Klopp made three changes with Shaqiri handed his first start for the club, replacing James Milner. Matip came in for Joe Gomez, while Roberto Firmino was back in place of Daniel Sturridge. Liverpool started assertively as they set about looking to record a seventh win in succession and set a new club record in the process. Firmino glanced well wide from a Shaqiri cross early on, while the Reds needed a fine block from Virgil van Dijk on a near-post effort from Long to keep the scoreline goalless. However, the breakthrough arrived after 10 minutes. Sadio Mane’s intelligent pass into the left channel from a cleared corner released Shaqiri into space. His eventual shot struck Long and then Hoedt before diverting into the back of the visitors’ net. The Reds threatened to extend their advantage on 21 minutes when Salah and Firmino exchanged passes on the edge of the area, only for the Egyptian to be denied a strike at goal by Cedric Soares’ last-ditch challenge. However, from the resulting corner, Matip planted a firm header into the corner of the net to double the stronghold. Southampton could have cut the scoreline in half three minutes before the break, but Pierre-Emile Hojbjerg miscued from 12 yards out after Ryan Bertrand’s centre had found him unmarked. Liverpool sprung forward quickly and Salah’s improvised back-heel under pressure from Jannik Vestergaard evaded the bottom corner by a matter of inches. The No.11 had never previously gone four games without a goal for the Reds – and today wasn’t about to be the day that statistic changed. In stoppage-time, Shaqiri’s sublime free-kick from 25 yards crashed against the underside of the crossbar and bounced up, allowing Salah to stab in from a yard out and make it 3-0. Liverpool made a change during the interval with Shaqiri making way for Milner – and they were forced into another substitution shortly after the restart as Van Dijk failed to recover from a midriff issue, with Gomez sent on to replace him. The hosts dominated the ball for the majority of the half, but there was little to report in terms of chances for either side. Andy Robertson scooped a late volley over the crossbar and Salah had a goal ruled out for an adjudged offside at the finale. But Liverpool’s work had been done in the first half – and their winning sequence stretched to seven games in all competitions.